[Get to Know] Korean Two Jaw Surgery vs Korean Face Contouring - 짱이뻐! 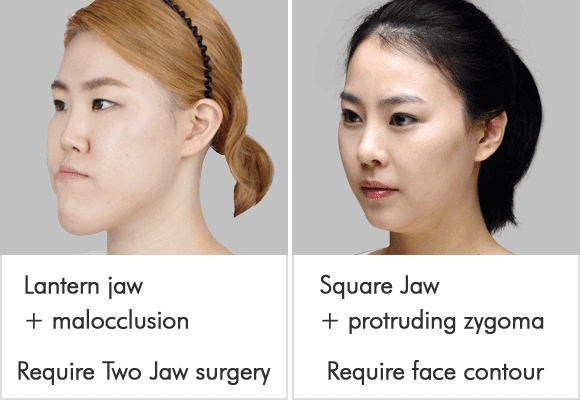 Let's see, is Korean two jaw surgery is for cosmetic purpose? Not really. Everyone want to be pretty but NOT everyone needs two jaw surgery. At Wonjin Plastic Surgery Clinic Korea, Korean two jaw surgery is not only for cosmetic purpose but to fix a functional problem which is caused by protruded jaws or opened mouth. Look at her, even we can see that it's hard for her to swallow food. She always had to take disgestive pills because she couldn't chew to swallow food. In this case, it can be fixed by performing Korean two jaw surgery, balancing the jaws, wearing braces and straightening the irregular teeth. Risk of Korean two jaw surgery is always been an issue. However, accurate diagnosis and suitable surgery for each patient is the best way to avoid all the side effects. That's why, detailed information of each patient is very important to be told to the doctor during the consultation and examination. Again, NOT everyone needs two jaw surgery. Having huge face doesn't mean you need two jaw surgery either. The doctor in Wonjin has to examine your condition to know if you really need the surgery or not. If your teeth are straight, and youw jaw bones are in their place supposed to be, then you don't really need it. It might be you just have squared jaw, or big cheekbone, and Korean face contouring is all what you need. This is why you have to take detailed examinations to know your face condition before judging whether you need Korean two jaw surgery or Korean face contouring. But, if two jaw surgery only improves functional problem, why should I go to Wonjin? Can't I just get it from general hospital? Yes! You can. However, at Wonjin Plastic Surgery Clinic Seoul Korea, you can get not only the functional improvements but also beautiful changes at the same time. Wonjin Beauty Medical Group manages a total medical treatment system by collaborating 6 medical departments; Oral Medicine, Orthodontics, Narcotic Pain Medicine, Otorhinolaryngology, Dermatology and Plastic Surgery itself. Based on the opinions from all specialized surgeons in each department, an accurate diagnosis is made and a precise surgery planned is set. Thank you so much for the best information. It was really good to know about Jaw Surgery. I have read few similar blogs related to this which would help you enhance your blog and information about Jaw Surgery in Korea. Keep up the good work.